If last year’s financials told us anything, the ‘80s are more profitable than diamond-incrusted BB-8 models that manage stock portfolios. Reagan-era properties like Star Wars, Secret Wars and The Dark Knight made up an overwhelming chunk of the books that sold in comic book stores. Though this narrative neglects the growing book store, digital and international markets, it does beg the question whether publishers will fall back on a sequel-begot-sequel ouroboros. Thankfully, the answer is probably not. This year packs an absurdly promising line-up of experimental books within both mainstream genre fiction and the indie tributaries. Example A: Atlantic behemoth Ta-Nehisi Coates is writing Black Panther. Is there a precedence for a literary journalist immersed in politics and race relations diving into the world of an African King superhero who manages the underworld? No. And that’s amazing. 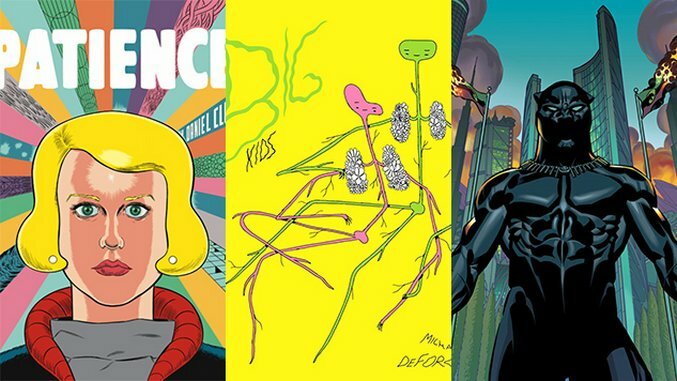 Elsewhere, Dan Clowes is releasing a new sci-fi romance, Paul Dini will reconcile genre fiction with real world atrocity, Gilbert Hernandez will unveil the sexuality behind the Bible, and Michael DeForge will unleash a brutally honest coming-of-age vivisection. This year has the potential to be brave, and that’s all we can ask for as lovers, makers and readers of comic books.